41612-PN is rated 5.0 out of 5 by 10. Rated 5 out of 5 by Artist Ruthie from Looks as Good as It Works I placed this grab bar just inside my walk in shower, vertically at about shoulder height. It is polished nickel and matches the Delta shower fixtures, so it looks really good while it gives me a helping hand. I had it professionally installed and it is very sturdy. I also added a horizontal 24" matching grab bar along the shower wall. They both have a modern look, unlike the ones you see in hospitals, which only make you feel old. 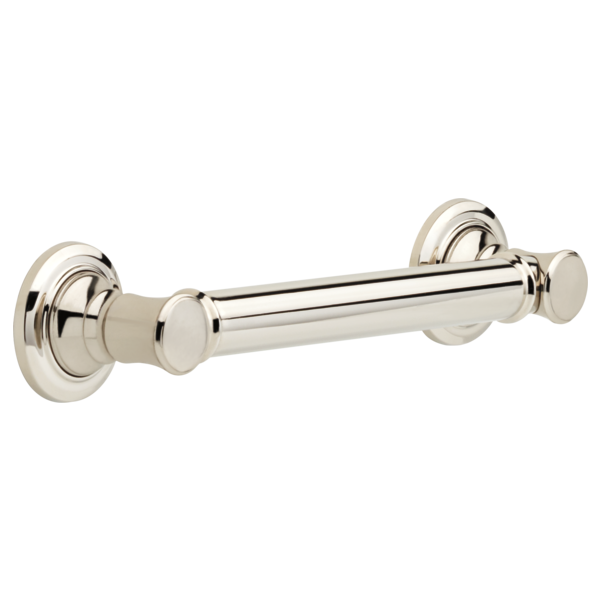 This grab bar is worth the extra coast if you are interested in having a seamless look. I am planing to use the same grab bars when I remodel my guest bathroom. Rated 5 out of 5 by jmc from Great for Remodelers This is my go-to bar for shower remodels. It compliments most styles. It not only look good, it is very solid and well-built. Rated 5 out of 5 by Dadathome 52 from Delta 12” grab bar #41612 Nice grab bar. Blends with our plumbing fixtures in our shower. Easy installation. Thank you Build.com. Rated 5 out of 5 by Trudy from Grab Bar Review Grab bar looks great and is functional. Rated 5 out of 5 by PZ from Like the look! We were very happy with the Delta grab bars in our first bathroom renovation so have added them to our other two bathrooms during renovations. These grab bars vary from others in that they don't have an institutional appearance. They actually add to the room's decor. We have the matching toilet paper holders and towel racks which also double as assist bars. They make our bathrooms more safe without the look of generic grab bars. Love them! Rated 5 out of 5 by Rdav from Awesome grab bar. Easy to install! Rated 5 out of 5 by Rosakins from Functional and Stylish My interior designer friend was mortified when I wanted to install grab bars in my newly remodeled shower. But, I knew their importance because I'd severely broken my foot several years ago while hiking, and I wished I'd had them then. Besides, I'm not getting any younger. I'm happy to say that they I love having the security, and my friend agrees they don't detract from the aesthetic of the shower because they coordinate nicely with my Moen shower components. I'm happy I chose these. Rated 5 out of 5 by dg from Traditional design with good functionality This grab bar fits in very well in a tile shower. The style fits well with other traditional faucets and fixtures, while providing a strong, secure hand hold for safety. Hello: I purchased 12&quot; and 24&quot; Traditional grab bars (the model # for the 12&quot; is 41612). Is it possible for me to order four flange covers in the Champagne Bronze color? I have read questions and answers on the towel bars and robe hook, stating they should not be installed in the shower due to the mounting hardware not being rust resistant. Is the mounting hardware for the grab bar different? How do you install the Delta 4612 and 4618 in a tiled shower? Instructions included are for drywall. Do you have a grab bar with a textured hand surface area?